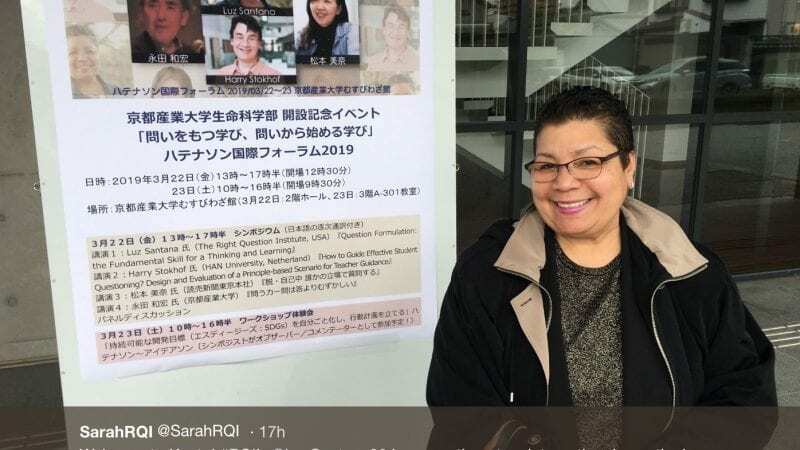 In March, 2019, the Right Question Institute’s Sarah Westbrook, Luz Santana, and Tomoko Ouchi are in Japan, where the Question Formulation Technique has become increasingly popular. They will be traveling to Kyoto for the International Hatenathon Forum, organized by Ken-ichi Sato of Kyoto Sangyo University. “Hatenathon” combines the Japanese words for “question mark” and “marathon.” The forum celebrates learning with questions and includes an international lineup of speakers, including Santana. Santana’s book, Make Just One Change: Teach Students to Ask Their Own Questions, which she co-authored with Dan Rothstein, has been a national best-seller in the pedagogy category in Japan. English-speakers may be interested in Ouchi’s thoughts on question formulation in the Japanese language, which has four different words for “question,” each with distinct meanings and connotations. It brings added nuances and dynamics to the Question Formulation Technique in that language. In addition to their time in Kyoto, the RQI crew will be in Tokyo working with educators, graduate students, and business professionals.